I've spent most of my TIG welding practice time on aluminum, but have recently started to experiment with stainless steel (all 304 for now). It's difficult! Most welders say that aluminum is the most difficult because it liquefies quickly and has oxide layer problems, but in my opinion, stainless is more difficult because of the shield gas requirements. .040" tungsten -- my local welding shop convinced me to try this instead of 1/16" tungsten. They somehow thought I could weld with less heat while using .040". I didn't understand it when they explained it so me, and I still don't -- especially since it makes no difference that I can tell. Here's a 1/16" thick 304 sheet. The upper bead was done with 10CFH argon, the lower bead was 20 CFH. The picture shows the front and back of a simple bead with 1/16" filler. 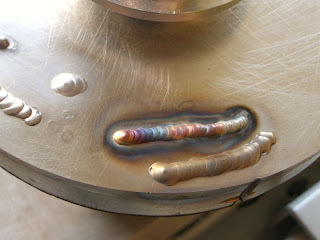 I was using as absolutely little heat as possible, sometimes solidifying the weld pool as I moved, making for an irregular bead. These beads both have major problems. They are pretty gray except on the left side where I finshed the weld and the post-flow cooled off the bead. The rest of the weld cooled outside of the gas shield, turning it gray, which is bad because the structure of the stainless steel has been altered. This will likely lead to corrosion or stress cracks. I prepped the left side of the top surface to see if it would be any different than the un-prepped right side. The metal has a smooth almost plastic-like feel, so I was unsure if this was normal. It didn't seem to make any difference. The backside shows major problems too. The upper bead looks better because there was more sheet metal all around the weld to soak up excess heat. The lower bead is "sugared" because it got very hot in an oxygen atmosphere. The weld is close to the edge of the sheet metal, so the heat built up more quickly. To attempt to fix the topside problems, I've ordered a "large gas lens" setup with some huge gas cups from an online welding store. I tried to order these parts at my local welding shop, but they didn't have them, and were somewhat hesitant to even order them for me. I have no idea if the large gas lens will work, but the parts are relatively cheap. To attempt to fix the backside problems, I've ordered some Solar Flux B, which was originally made for gas welding stainless steel. The alternative to flux is to build an argon purge for the backside of welds. 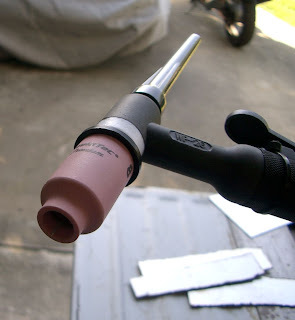 This purge could be a box, a nozzle, or some other device to make sure the backside is flooded with argon. The problem is that every weld situation (tubes, sheet metal, angle, etc, etc) requires a custom purge setup, and argon isn't exactly cheap either. I'll definitely be posting more information about the flux in the coming weeks. Here's a weld made on thicker (about 1/8") stainless. The grade of stainless is unknown. Don't mind the soot. I was just too lazy to regrind my tungsten after I hit it with the filler rod. Notice the bead is NOT gray. The thick metal is able to pull heat out quickly enough to prevent problems. Unfortunately, most of my stainless welding will be on tanks and tubes that will never be 1/8" thick. I need to find a solution that will work down to .049" at least. Bent TIG electrode = trailing shield?